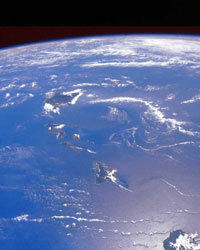 The Earth temperature is determined by the balance between in and out energy. Current temperature increase is mainly due to lose the balance by increase of CO2.CO2 is discharged by igniting fossil fuels and has characteristic that absorb the heat from the earth, so that it is called greenhouse effect gas. There are other gasses which have same effects, such as methane, flon, and nitrous oxide. After 1980, average temperature in the earth has rapidly increased. There are several phenomenon such as heat wave and drought occurred due to global warming. Because of increase the temperature of ocean water, the level of ocean rose up. As a result salt water goes into underground water and rivers. The decrease of rain water causes desertification so that the agriculture is destroyed in the world. Global warming causes the lack of food in the world seriously. 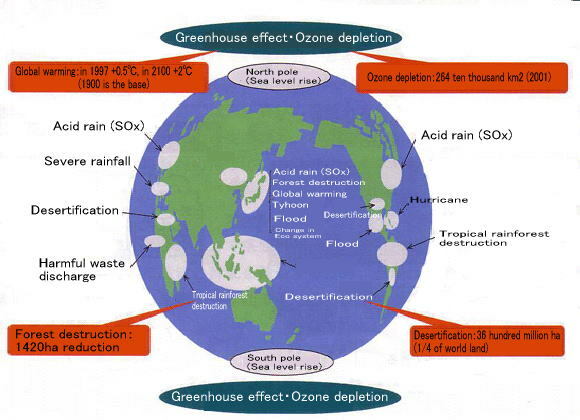 he factors of destroying ozone layer are artificial chemical substances such as flon and halon which had been used in refrigerator and sprays. When these matters rise up, chlorine atoms are produced by reaction with strong ultraviolet rays. Chlorine atoms take oxygen atoms from ozone, and a ten thousand ozone are destroyed by the one atom. Ozone exists at a height of 20 km and makes ozone layer. Ozone absorbs ultraviolet rays from the Sun. Ultraviolet rays causes skin cancer, cataract, and genetic defect. Ozone layer which absorbs ultraviolet rays has been destroyed. 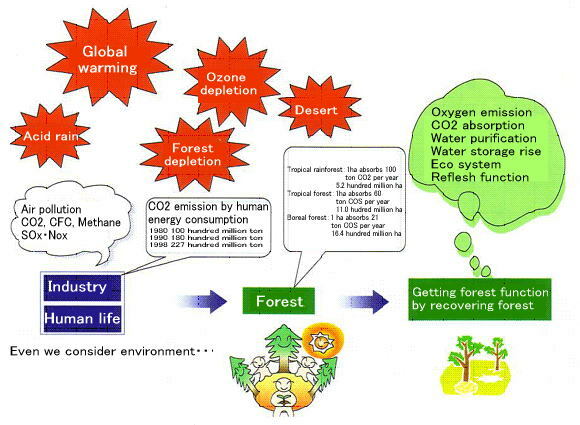 The factor of deforestation is the uncontrolled use of the area to industrial tree felling and agriculture. Igniting fossil fuels produces nitrogen oxide and sulphur oxide and these substances are changed nitrate ion and sulphate ion which leads acid rain. Acid rain destroys forests. Deforestation causes not only the extermination of living things but also decrease CO2 absorption, thus speeding up global warming. Tropical forest destruction also speed up. If it lasts this situation, it reports that all tropical forests will be destructed by 2030. In the mid of 1980, there are 19 hundred million ha tropical forest. In every year, 1420 ten thousands ha are cut and changed to agricultural fields every year. Forestation is only 1 hundred thousands, and it is just 1/10 of decrease area. The factors of desertification are excessive farming, overgrazing, and overcutting. On the background, there is population growth. To obtain enough food resource, lands are used endlessly thus desertification occurred. That causes more lack of food so that leads negative cycle. Every year, 600 ha desertify. There are also 21 million ha agricultural area decreases its productive ability. The agricultural productive ability decreases in the area where desertification progresses. Thus, there is serious issue of starvation and lack of nutrient.